I'm back on the Tutti Designs Blog again. 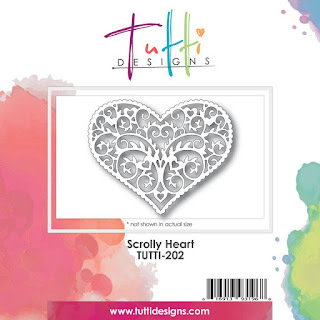 Today I am sharing two cards with you made with the same fabulous die, Tutti Designs Scrolly Heart from the November 2016 Release. This die is so pretty and detailed it will make your heart skip a beat! I created a bit of a Shabby Chic design, distressing and peeling back the edges of my double sided Designer Paper. The star of the show, the Scrolly Heart die, was cut from White card stock and then sponged lightly with Melon Mambo and Pink Pirouette inks. I backed it with Pink card stock, which was fussy cut. My sentiment is by PTI, Swoosh stamp set and stamped in Melon Mambo ink on to a Vellum Strip. I then covered it in Clear Embossing Powder and heated it, I do this every time I stamp on to Vellum. I am notorious for having smudges! Accented with Adhesive Pearls, Sheer Pink Ribbon, Heart Button, Twine and Mini Clothespin. My second card is basically the exact same, only this time I used my Scrolly Heart die as a stencil. I bought this new product (to me) Cut-Your-Own Stencils Material by Stencil Ease, found at my local craft store. I got 10 sheets, 12" x 17.5" for only $4.00. The original price was $9.99 but I used a 60% off coupon! What a great deal! Here's what the die and cut stencil look like. Check out all of that AMAZING detail!!! 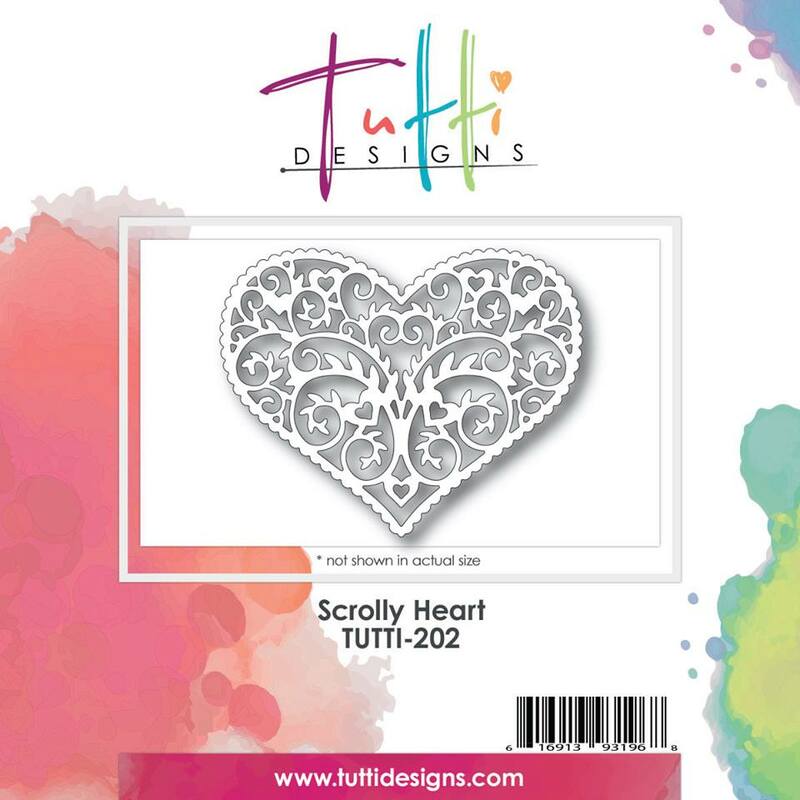 The Scrolly Heart die cut the stencil material like buttah! Second card same as the first using the stencil. LOVE the shabby chic look here. Curling that corner to show the color beneath is so clever. I love all your elements too, from the pretty bow, to the cute clothespin, to the wonderful vellum overlay for the greeting. Oh, and then the pearls and that sweet little heart embellishment. This card is perfect in every way!!! This is sooo pretty,Donna. I love all the little touches, the rolled back paper, pearls, heart and twine vellum and that darling stamped clothespin. Donna outside the box again. How refreshing to see something so beautiful after all the spooky Halloween cards I have been making..very gorgeous Donna! So many beautiful details on your card, Donna! The folded corner is one of my favorite things to do on cards. Love the die cut sentiment over the vellum too. I love the shabby chic look and that is a beautiful heart die. Great job with the shabby chic. I have such a hard time with it. Loving that pretty scrolly heart.